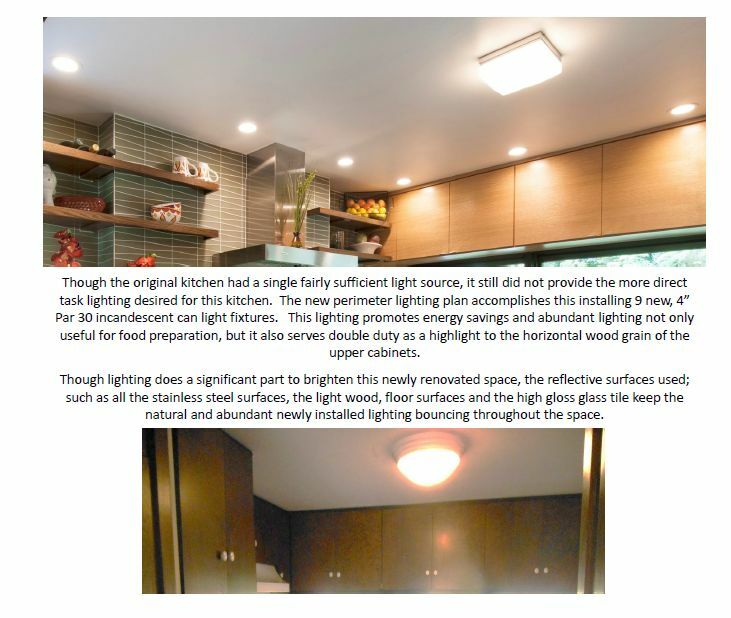 NJW Construction > news > PART IV Mid-Century Modern Kitchen Remodel – CotY AWARD WINNER! As you already know we were recognized for one of our kitchen remodeling projects. We were awarded the CotY award (Contractor of the Year). Over the last few weeks we have been sharing our CotY award winning kitchen- Take a look at the FINAL part of this series! -Horizontal oriented, quarter sawn red oak veneer, flat slab door and drawer panels. Note: Door style to reflect original doors to maintain minimalist design. -Full overlay, frameless, door style design utilized to continue flush, seamless, continuity throughout. -Cabinets ran full height to maximize spatial volume. Finishing the cabinets at the ceiling the trim is inset. This design is to maintain the flush cabinet design. 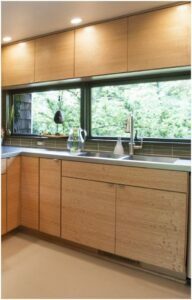 -Clear finish applied to cabinetry to keep the kitchen as light and bright as possible, also to maximize the decorative character of the wood grain. -Completely enclosed appliance panels to harmonize the kitchen. – Cabinetry hardware, pull tab style, was selected for its lineal, contemporary and minimalist design style. 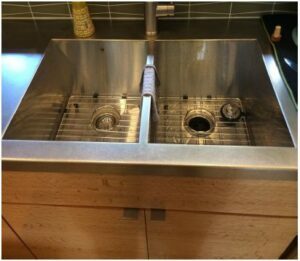 Stainless Steel Counter Top Highlights -Eased front edge for comfort -Suede finish to reduce glare -Vigo stainless steel sink welded with stainless steel counter top for a seamless application. 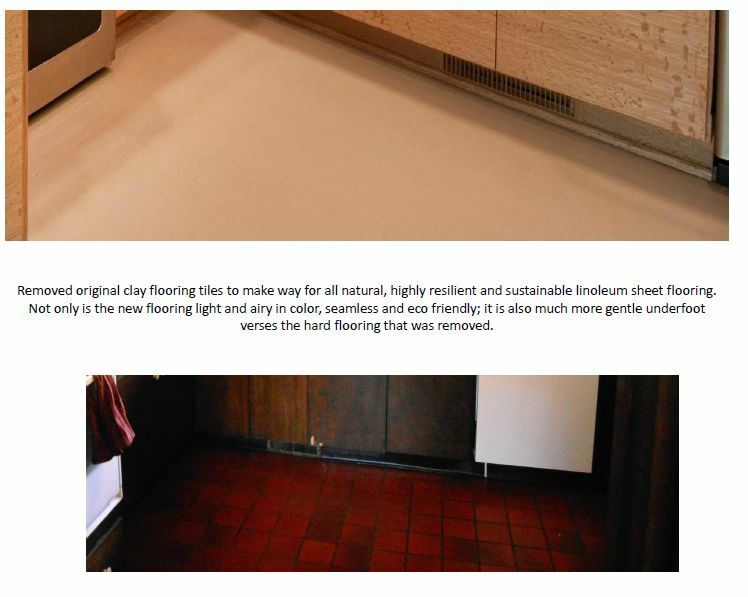 -No joints, this seamless design means no interruption to the visual eye upon viewing this counter top surface. -One piece counter top system coming direct from the manufacturer, weighting hundreds of pounds and due to size was quite restrictive on its movement through and already inhabited home. -Great efforts had to be taken to get the dimension right the first time, since the piece was locked in by layout in 6 locations; example; corners, wall bump outs and window moulding. 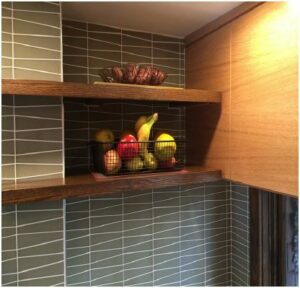 -In keeping with the lineal design within this space, a playful twist is installed on the backsplash. This glass tile called Waveline, continues ones eyes around the kitchen, yet brakes from the traditional straight line to add a punch of contrast. 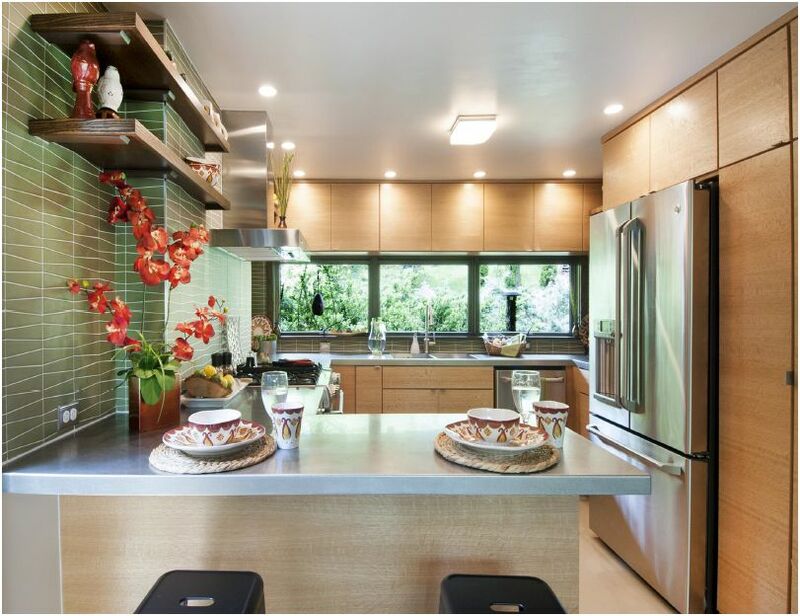 -The glass tile color choice is tied direct to the view beyond this kitchen. A seamless line of color flows from the kitchen walls to the dramatic wooded hillside exterior then back into the kitchen walls. This glass tile was very delicate to cut. A diamond blade was required for cutting and had to be changed out frequently to ensure a clean cut without damaging the usable tile portion. We hope you enjoyed all the components of this kitchen remodel! We currently build in Westerville, Worthington, Whitehall, Upper Arlington, Powell, Pickerington, New Albany, Lancaster, Hilliard, Gahanna, Dublin, Bexley, Columbus and all of Central Ohio.